Our Psorexederm Scalp Lotion is a concentrated scalp treatment to remove and relieve the flaking, itching and inflammation symptoms of severe dry scalp conditions caused by scalp psoriasis and seborrheic dermatitis. Removes the scale from your scalp - overnight the penetrating oil and mild acidic ingredients remove scale. Breaks up scale to allow quick removal - scale is simply washed out in the morning, with good healing in 14 days or less. Itching and scale regrowth is reduced - our formula reduces itching and also has an anti-fungal agent. Your hair is not made dry or brittle - the olive oil in our formula protects your hair and ensures your hair colour does not change. The formula is gentle on the healthy skin of your scalp - although highly concentrated, our formula is also low-irritant so your existing hair products, even dyes, can still be used. NOTE: Our standard scalp lotion is too strong for patients under 13 years of age. Please contact us for information about our 'Children's Strength' product. Our Scalp lotion is not recommended for use during pregnancy and when breastfeeding.Each order includes a dropper bottle to apply the lotion. 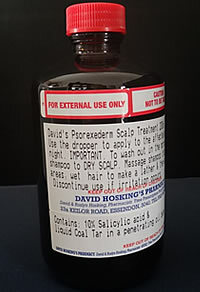 Why is David's Scalp Psoriasis Lotion so effective? Treatments with a penetrating Oil Base that are left on for a prolonged period will remove much more scale than any shampoo treatment. Applying our Treatment at night then washing it out in the morning will rapidly remove any problem scaling. The combination of coa ltar solution and the scale removing ingredient salicylic acid (a natural product of Willow Bark) in a penetrating olive oil base is what makes David's Psoriasis Scalp Lotion extremely effective. The salicylic acid in the lotion is used to break up and remove the scales, and at the same time it has an anti-fungal effect. The coal tar solution in the formula reduces itching and reduces growth of new scale. The Olive oil in the formula stops your hair from being dry and brittle, and it relieves inflammation.